First things first, loosen up. Sing in the car, dance around your room, stop worrying every once in a while and just follow your passions I promise it is worth it. High school is going to be an uphill battle for you, but you're going to treasure every moment of it. Every experience will only make you stronger and make you cherish the good things. You are going to struggle, really struggle to find a good group of friends, but I promise by senior year you will have a best friend and a couple of other close friends. The thing is your best friend is someone you would have never expected, but it makes sense she was always meant to be therefore you. Be open to people and also remember that people can change. Take changes because sometimes they will change your life for the better. One of your other close friends you haven't met yet and won't until your junior year and the other you have been friends with since 8th grade. 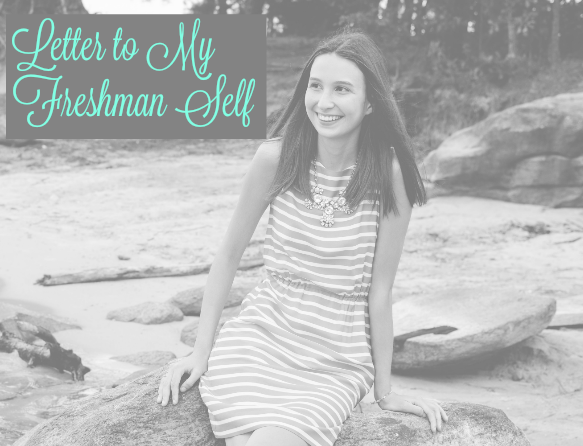 You are also going to struggle to find where you fit in, but your sophomore year it's all going to fall into place. You'll fall in love with community service and discover that you actually like playing a sport. Pursue these things they are the things that make high school worth it. Volunteer as often as you can. Pursue leadership roles, I promise the more involved you are the better. You'll never forget the memories spent laughing and having fun with your tennis team. You're going to do great in school though you will always be disappointed that you didn't do better. Don't do that putting that much pressure on yourself isn't good. Be happy with how well you do it really is something to be proud of, it's ok not to get the best grade as long as you are learning and doing your best. You are going to take the hardest classes. Some of your classes are going to really push and challenge you. You'll have some awesome teachers though and that will make it all worthwhile. Get to know your teachers, talk to them daily and connect with them. They care about you and they really do want you to succeed. Ask for help when you need it, do it! I know you don't want to but in some classes, this will be your saving grace. I'll admit it you probably took way more AP classes than you should have, but you thrive off the challenge. Embrace the challenge and always work your hardest. You know yourself well, so do what you are comfortable with your counselor isn't always right. You'll stress about finding and getting into your dream college. You'll spend weeks researching and touring colleges all around, but you'll find your place and spoiler alert you'll get to go there. You'll get in early decision and you will be absolutely over the moon. You will think that you can beat senioritis, but even you can't survive it. It's ok to skip a day, sometimes you really do need it. Your life isn't really going to come together until your senior year, the second semester of your senior year you will make some of the best memories of your life. You will make memories every weekend. High school isn't like high school musical, but high school is really important. It's not the best time of your life, but it's a time to learn and make memories that will last you for the rest of your life. Graduation day will come and you'll walk across the stage and you'll actually be a little sad, sad because high school was such a large part of your life and it's difficult to just walk away from. Cherish every moment, every day even in the days you are counting down the seconds until you get out because you honestly find yourself in high school and it would stink to miss out on any second of that.